Welcome to the website for All Saints Church, Hemblington. We do not know who built our church or when. What we worship in each week is a beautiful and simple building. The clear glass windows allow the light to flood the building. We gaze out at the rolling fields that surround the churchyard. This delightful building is very much part of the environment as the environment is part of the church. This is a church that takes the visitor far away from the rush of a busy world. The round tower reminds us of the long history of Christian worship on this site. Within it one of the country's largest wall paintings of St Christopher greets the visitor. 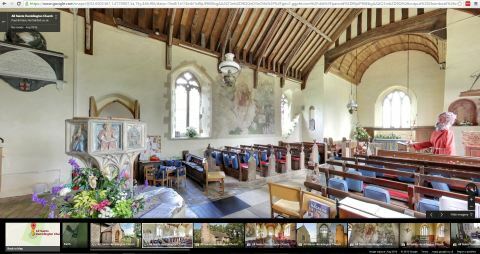 The uncluttered interior, medieval bench ends and magnificent font all tell stories of faith and worship throughout the centuries. Walking boots on, pencil to hand, it’s time to have a go at the walking trail Treasure Hunt, this year around the Hemblington and Burlingham area. If you tried to solve all the clues in last year’s treasure hunt, you will know what fun it is. If you didn’t, now’s your chance to find out! The entry forms are available at All Saints Church for just £5 per team. They contain all the instructions you need, and you can attempt the trail in one go, or do it over several sessions, as the mood – and the weather – suggests. The prize of a “Candlelit dinner for two” will be awarded in early September, as the closing date for completed entries is 31st August. All profits are going towards the Hemblington Church Repair Fund. You can pick up your Treasure Hunt forms any time – perhaps at the joint Hemblington Parish Council/ Friends AGM on Thursday, 6th June (7.00 pm). The main speaker will be that well known and respected landscape historian Prof. Tom Williamson (UEA). His theme will be “Trees and Woods of the Norfolk Landscape” but it will doubtless include much more in relation to the history of the area as well as some of his famous anecdotes. Refreshments will be available before the AGM starts. The first Garden Fair to be held at Hemblington Hall on Saturday, 30th March, was well attended and proved a relaxing, happy and successful event. The sun shone, the gardens looked lovely, the church team and The Friends of All Saints Church provided bread, cakes, refreshments and plants, well supported by a variety of craft makers selling paintings, cards, wickerwork and metal sculptures and beautiful patchwork cushions. Information was also available about home composting techniques, and the Blofield & District Gardening Club, including a garden tool sharpening service. The Fair was held to raise funds to help pay for building repairs needed at All Saints Church in the near future. A new magazine for our deanery has just been published which includes news from the churches across the Blofield Deanery. You can download it here. In addition to these services there will be our normal Holy Communion services at 9.30 am on Sunday 7th April and Sunday 28th April. The next Make and Mardle will be on Tuesday 16th April at Hemblington Church. It will be at the usual time of 10 am to 12 noon. As always there will be coffee, cake, chat and craft (optional); all are welcome. Call 270360 for more information. Our Lent course for 2019 will be a series of guided conversations together about worship in our churches, using a professionally produced course material designed for churches such as ours. The course will ask us to consider together what it means to be a worshipper and how each of us can play our full part in the worship of our benefice and the churches we attend. We would value hearing from everybody who joins in the worship of our churches, no matter how often you attend. The course will take place on Wednesday evenings at Blofield Church on 13th March, 20th March, 27th March, 3rd April and 10th April. A course booklet will be available, priced £5. But have a look round the rest of the website for interesting insights into our local heritage. For anyone who is researching family history in the Hemblington area we have a page explaining how you can access our church records. 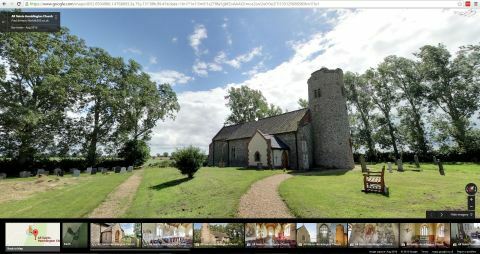 This is video shows our beautiful church on a lovely summers day in June. Music by the Octagon Singers of Norwich.